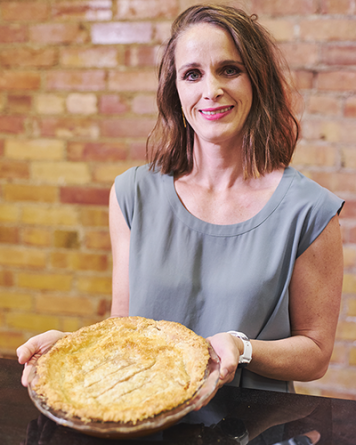 No offense to the incredible pastry chefs who brighten up our lives at every bakery and eatery along the Wasatch Front, but you don’t need a diploma from The Culinary Institute of America to make great pies (although it can’t hurt to have one). 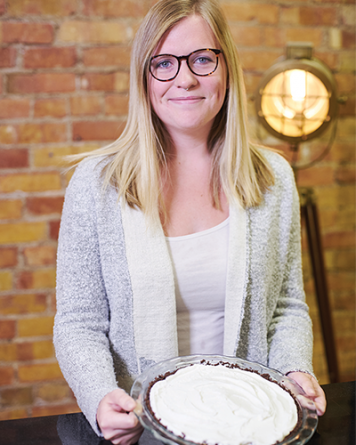 It’s not that unheard of to find noteworthy pie-makers in your midst, and by that, we mean, in the next cubicle. And by pie, we mean the dessert kind—custards, fruit fresh, cream—the circular dessert that marries crusts and fillings, sometimes with crumbs, sprinkles and shavings on top. 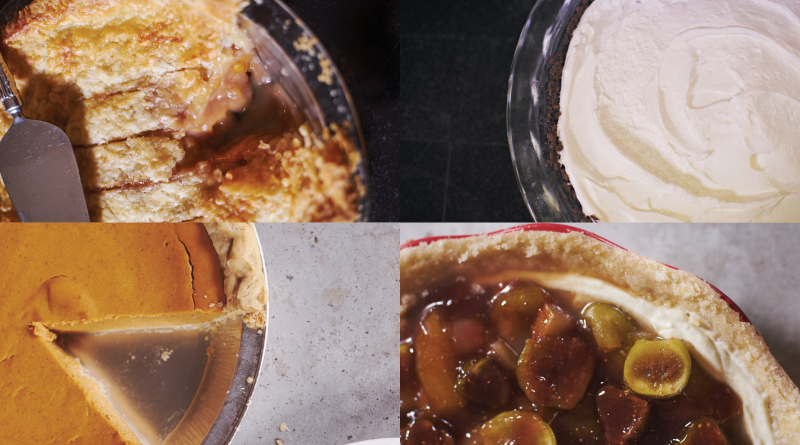 We asked four of our resident pie experts—business manager Paula Saltas, Devour writer/office admin Anna Kaser, copy editor Sarah Arnoff and freelancer Heather May—to make our work day a little brighter (but not necessarily lighter) by whipping up their favorite holiday pies and sharing their recipe with the staff. Pssst, that means we’re sharing it with you as well. 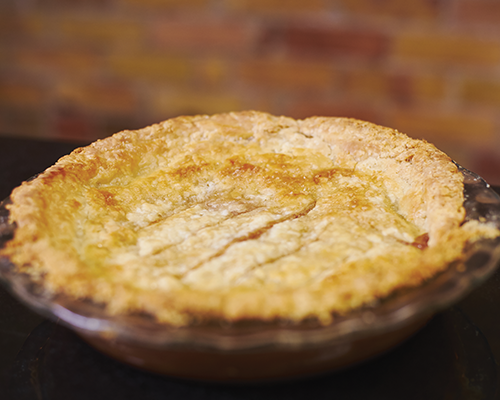 Numerous Copperfield employees who taste-tested will confirm these pies rock! So, go forth and impress your family and friends with these showstoppers. you add a few forgetful years and some variations in cooking technique, the waters start to muddy around certain recipes. No one can quite remember whose recipe was whose. In my family, each of us thinks we came up with the original. I was still in elementary school when my grandmother brought out a simple recipe for me to make dessert. Her recipes were always a little dirty, having been made multiple times. You knew that a recipe was tried and true if it landed in her recipe box. She chose this specific one for me to make because it was simple, and even though I enjoyed cooking, I lacked patience for complex ingredients and techniques. Preheat the oven to 350 degrees. Pulse cookies in a food processor until broken but not yet fine. Add the melted butter and continue processing until fine. 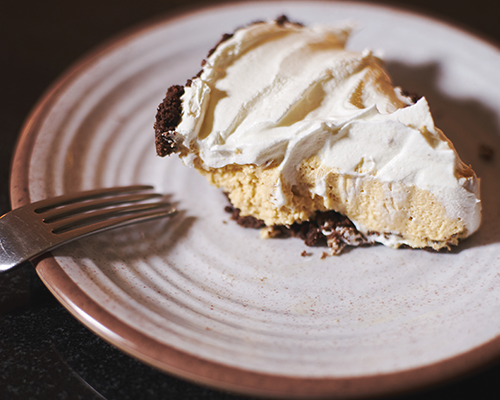 Press crumb mixture into a 9-inch pie pan with your hand or a cup until the cookie mixture is evenly spread. Bake for 10-15 minutes. Remove and let cool completely. Mix softened cream cheese, sugar and peanut butter until smooth. Mix in 1 tub of Cool Whip until smooth. Top with remaining Cool Whip as desired. Chill and serve. I’m the obstinate one who won’t eat pies from box stores and chain restaurants because I find them too sweet and too spicy. Because of that, my family put me in charge of baking pumpkin pies every Thanksgiving. After much experimentation, I found that Paula Deen’s recipe hits it out of the ballpark for me. It doesn’t have that overwhelming traditional pumpkin-pie-spice flavor that many bakeries put into their custards. Makes 1 deep-dish 9½-inch pie. Don’t expect any leftovers! Happy baking! 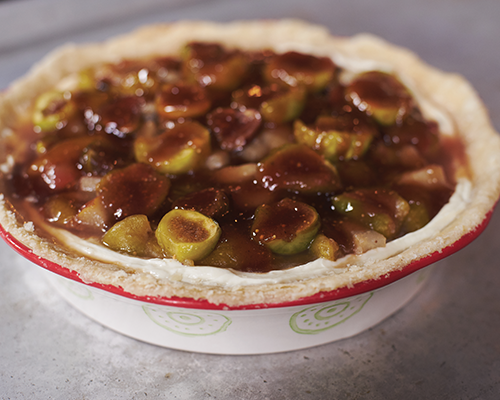 Place pre-made pie dough into 9½-inch pie pan and press down along the bottom and all sides. Pinch and crimp the edges together to make a pretty pattern. Put the pie shell back into the freezer for 1 hour to firm up. Fit a piece of aluminum foil to cover the inside of the shell completely. Fill the shell up to the edges with pie weights or dried beans (about 2 pounds) and place it in the oven. Bake for 10 minutes, remove the foil and pie weights and bake for another 10 minutes or until the crust is dried out and beginning to color. For the filling, in a large mixing bowl, beat the cream cheese with a hand mixer. Add the pumpkin and beat until combined. Add the sugar and salt and beat until combined. Add the eggs mixed with the yolks, half-and-half and butter, and beat until combined. Finally, add the vanilla, cinnamon and ginger, if using, and beat until incorporated. Pour the filling into the warm prepared pie crust and bake for 70 minutes, or until the center is set (Paula Deen’s recipe only calls for 50 minutes but I cook mine for 90). Place the pie on a wire rack and cool to room temperature. 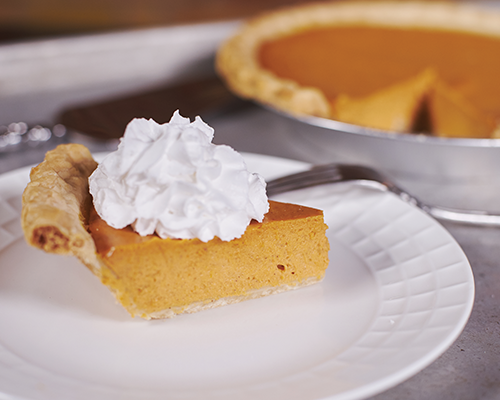 Cut into slices and top each piece with a dollop of whipped cream. People often think that because I work in a creative field, I must get super experimental in the kitchen. But baking, for me, is more of a clear-my-head stress reliever with lots of structure and precision. It’s really nice to just follow directions and have a tasty product at the end. 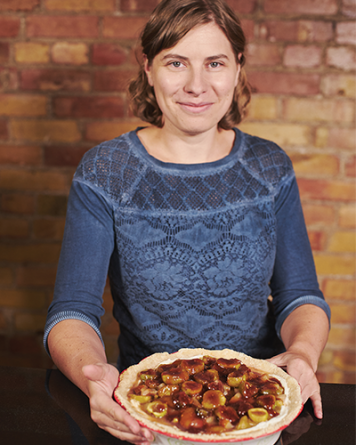 I started baking pies specifically when looking for something different to bring to a Pie & Beer Day gathering a few years ago. I’ve since become very fond of tracking down off-the-beaten-pie recipes, like this fig and goat cheese one. Fresh figs taste wonderful with the goat cheese but dried work fine—you can source fresh figs from Liberty Fresh Market, but I was lucky enough to have a friend who grows them in his backyard. For the crust: Combine flour, sugar, salt and butter in a food processor. Pulse until the mixture resembles coarse meal. Combine the ice water and apple cider vinegar and drizzle on top. Pulse until the dough just comes apart. Turn the dough out and pat into a disk. Wrap the dough in plastic and refrigerate at least 30 minutes. On a floured work surface, roll out the dough and set in a pie dish. Refrigerate at least 15 minutes. Preheat the oven to 350. Line the crust with foil and fill with pie weights or dried beans. Bake for 20 minutes. Remove the weights and foil, press out any bubbles and bake for 30 more minutes or until golden brown. Line crust edges with foil to prevent burning if necessary. Let cool completely. For the filling: In a large saucepan, combine figs, pears, apple cider, pear brandy, honey, lemon zest, lemon juice, cinnamon, cloves, allspice and salt. Bring to a boil, then down to a simmer. Simmer until the figs are plump and pears are tender, about 10-15 minutes. Strain the liquid into a bowl and discard the lemon zest. Set fruit aside. Return the liquid to the saucepan and boil until it’s reduced to a thick syrup, about 15 minutes. Combine goat cheese and honey in a bowl. Beat with an electric mixer until the goat cheese is crumbly. Drizzle the cream into the bowl while mixing until it reaches a creamy consistancy. Beat in the vanilla. Spread goat cheese into the pie crust, making sure to coat the sides. Top with fruit. Decorate with extra pear slices and drizzle syrup on top. Sounds wrong, but, yes. My holiday tradition is that I have no tradition. I like to try new pie flavors every year. This year, I know it will be peach because this summer I canned 50 pounds of peaches, fresh from the orchard to a farm stand near me. It might be unconventional, but who decided lemon meringue made sense for Thanksgiving? No matter the filling, I always follow Bon Appetit’s Flakiest Pie Crust recipe. It’s so yummy, it almost doesn’t matter what’s underneath. In this case, the canned peaches are complemented by a light caramel that evokes fall. For the crust: Mix flour, sugar, and salt in the bowl of a food processor. Add butter and pulse until the butter is the size of small peas. Place mixture in a large bowl. Combine vinegar and 3 tablespoons of ice water in a small bowl. Slowly drizzle over flour mixture and mix with your hands. Continue adding liquid and kneading in the bowl until it starts to form clumps. Turn dough out onto a lightly floured work surface and knead until clumps form together. Divide dough into 2 pieces and press into disks. Wrap with plastic and set aside one disk for another pie; it will freeze up to a month. Chill the other disk for at least an hour. For the filling, combine ½ cup sugar with the cinnamon and salt in a large bowl. Add quart of peaches (along with syrup) and lemon juice. Set aside. Stir remaining ½ cup of sugar with ¼ cup of water in a saucepan over medium heat until sugar dissolves. Increase heat and boil without stirring, occasionally swirling the pan, until syrup is amber. Remove from heat and add butter and whipping cream. Stir caramel until smooth. Strain juices from peaches into the caramel. Preheat oven to 375 degrees. Add caramel and flour to peaches in bowl and gently stir. Transfer filling to pie dish. Roll out one disk of dough and arrange over the top of the filling. Decorate the edges as desired, and cut parallel vent lines in various sizes down the middle. Brush the crust with the beaten egg and sprinkle with raw sugar. Cook on a baking sheet lined with parchment paper for 35 minutes. To prevent overbrowning, tent loosely with foil and continue to bake for another 20 minutes until filling is bubbling and crust is nicely browned.